I love to landscape.....So my plan was to build a 'Secret Garden' in my backyard so I could hide, relax and enjoy my birds and flowers. My idea was to have 'Cottages' for the birds, archways, walkways with raised flower beds, benches, smaller ornamental flight cages in the gardens for my 'house birds' for the summer months, flowering trees and bushes, and of course....my hidden hammock and pillow! The new loft is a 'display model' that I purchased for 60% off the original price....A little 'weathered', but it works for me! which I didn't want. 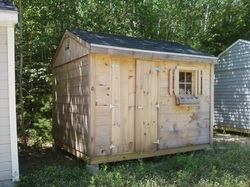 I picked this 8X10 pine shed, whereas it matched my other loft the best. Only had to wait a week for FREE delivery! I started by putting 1/4 inch hardware mesh on the ground and setting the frame on top, leaving enough to curl it up to totally 'wrap' the flight cage to keep rodents out! Page still under construction......More to come!